PLEASE PRESENT ALL OFFERS THRU LISTING BROKER BILL DONOHUE AT 732-920-9660 or MOBILE PHONE # 732-996-2696. Originally used in the Great Lakes prior to 2002 by previous owner! Current owner looking to upgrade. 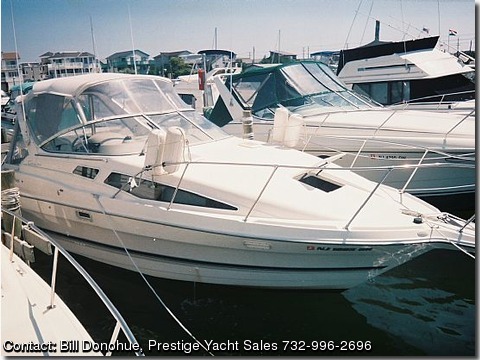 This well maintained boat is priced to sell and chock-full of add-ons. Makes a terrific family boat. The mid-cabin floorplan of the 2855 Sunbridge is arranged with double berths fore and aft and a convertible dinette which can sleep two. Privacy curtains separate both sleeping areas and headroom is adequate throughtout most of the cabin.She sleeps six total. She is equipped with recently added 12000 BTU A/C Reverse Cycle Heat/with Dehumidifier Control. The head is to starboard with maserator system and stand-up shower. The galley is to port. Microwave Oven, Two Burner Stove (electric/Alcohol), Dual Voltage Refrigerator w/Freezer (12/120), Hot and Cold Water, as well as a Stainless Steel Sink . – Bennet Auto-Tab Control System with two helm keypads! Well Maintained showing minimal wear and tear from normal use with minor cosemetic imperfections. Previous registration prior to this owner's purchase three years ago was Michigian – the fresh water Great Lakes! The vessel is sold as is by current owner without any warranties. She needs new bottom Paint and Anodes for the outdrive. Otherwise, she is in very good condition. With all the add-ons – a must see!